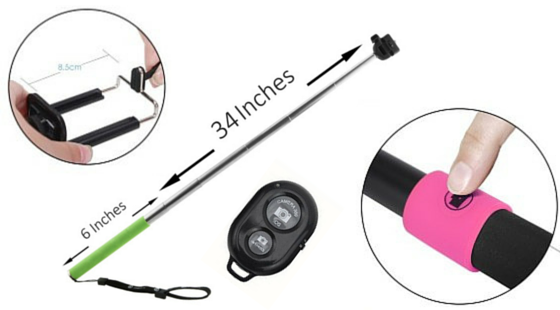 As regard to the above topic, I would like to explain in detail about the functions of each and every part of a selfie stick as well as showing you how these features will be benefiting you. If you land on this page through my previous post “What is a Selfie Stick”, you should now know what a selfie stick is. In case you do not know what a selfie stick is, it is a stick (extendable up to 3 feet or more) to help users take their selfies (photos taken by your own). 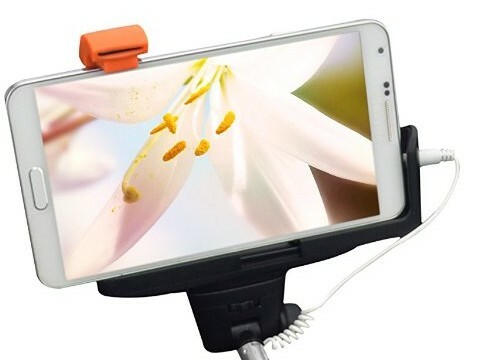 As you can see from the above picture, a selfie stick comprise of an extendable stick with a phone holder (which can be extended to accommodate phones of various sizes). Some selfie stick also comes with in-built bluetooth system or externally paired bluetooth system. I know you might be abit confuse now, don’t worry as I will be explaining part by part as we move forward. All selfie sticks are extendable, the only difference is how far can it go? 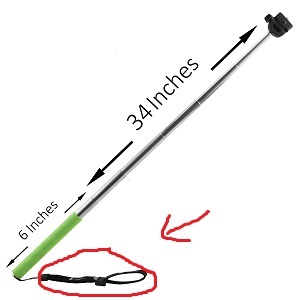 Normally, there is a standard length of extension where the selfie stick can go up to 34 inch (which is approximately 3 feet) as show in the diagram above. In case you do not know, an extendable stick allows you to take selfies from a desired distance (having a maximum limit of 3 feet). This is actually the main feature which makes selfie stick so popular nowadays. A handle allows you to hold the stick (LOL, something everyone knows). However, as you can see above, the handle comes with a soft-pad which makes the handle comfortable and promotes great gripping (the stick won’t slip off your hand easily). Note: Some products of selfie stick (normally of cheaper range, below $10) comes with a low quality handle, often uncomfortable and slippery. Just for your information, most selfie sticks (often all) do come with some sort of band connected to the string where you can hang the string around your wrist. Hey a selfie stick is cheap, but your phone on that stick is not! All selfie stick comes with a phone holder (mostly though). It is actually an add-on item to the selfie stick. Let me explain a bit of this gadget history so you can understand better. History: Selfie stick was initially known as a monopod (a professional device used by photographer wanting to increase their photos’ quality). So, it is design to support cameras only, not phone. So if you would like to use this selfie stick for your camera, you will need to unscrew the phone holder from it and screw it to the camera, and it looks like the picture on the right. Back to the topic, a phone holder is often included these days (because the suppliers know very well that more people are using hand phones on a selfie stick, very seldom a camera). Most phone holders are adaptable meaning that it is adjustable to suit t not coo your phone (just be careful because some products come with phone holder which are not compatible with some phone model). As you can see in the picture on the right, the orange part can be adjusted to suit the height of your specific phone. The length of the phone is definitely not a problem as we can see in the picture. Just make sure that your phone are placed and gripped properly by the orange gripper to make sure that your phone don’t fall. This is just one example of phone holder, there are many types of phone holders out there but collectively, they perform the same function. To be frank with you, all these different types of selfie stick have their own pros and cons despite price differences. I have written an in-depth review regarding this topic so you will know which one from the above suits you best. 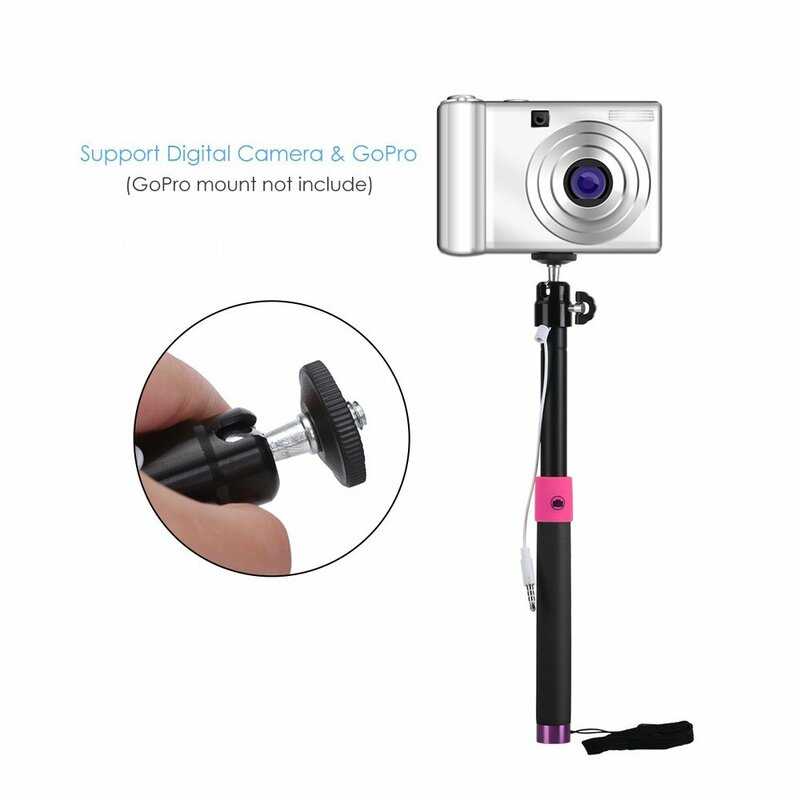 Please visit this post, “Selfie Stick Review Resource Page”. This page explains all of these selfie stick in detail and more importantly helps you make the right choice! As mentioned above, some brands do not come with a bluetooth device, however you can definitely purchase this bluetooth device as an add-on item. This bluetooth device makes it easier for you to take picture by just pressing the button on the device. Before that, you will need to pair the bluetooth device with your phone system before it can work. Note: When choosing the right bluetooth device, make sure that the device is compatible to your phone (android and i-phone do make a difference). When selfie stick starts to attract attention from a large number of people, suppliers start to improve their products by creating in-built bluetooth system to improve user-experience. 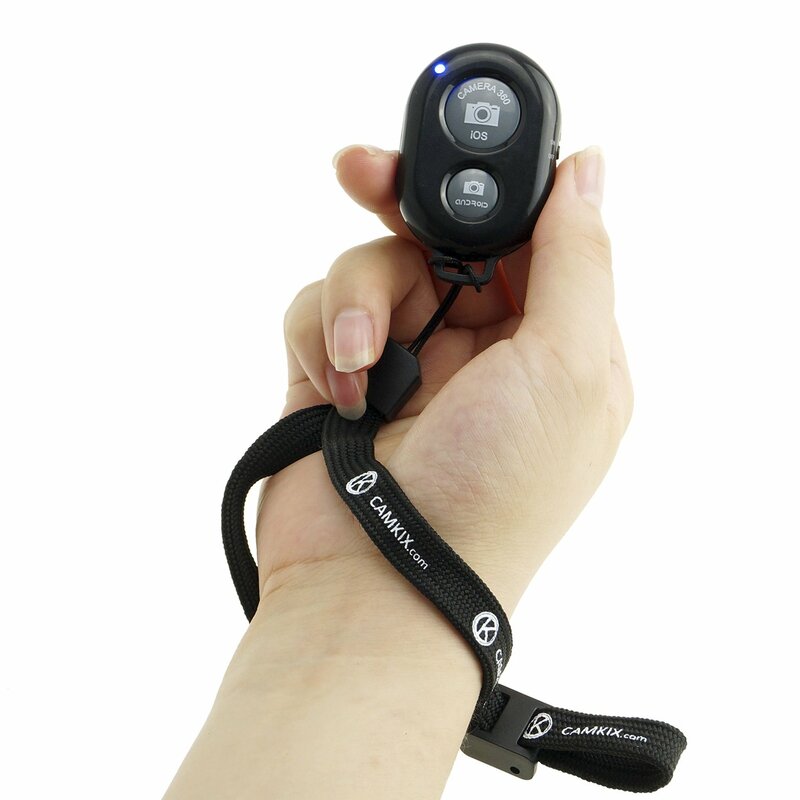 In-built bluetooth system means that the button is within the handle itself. This makes it more convenient for people to capture photo without having to carry another external device around. 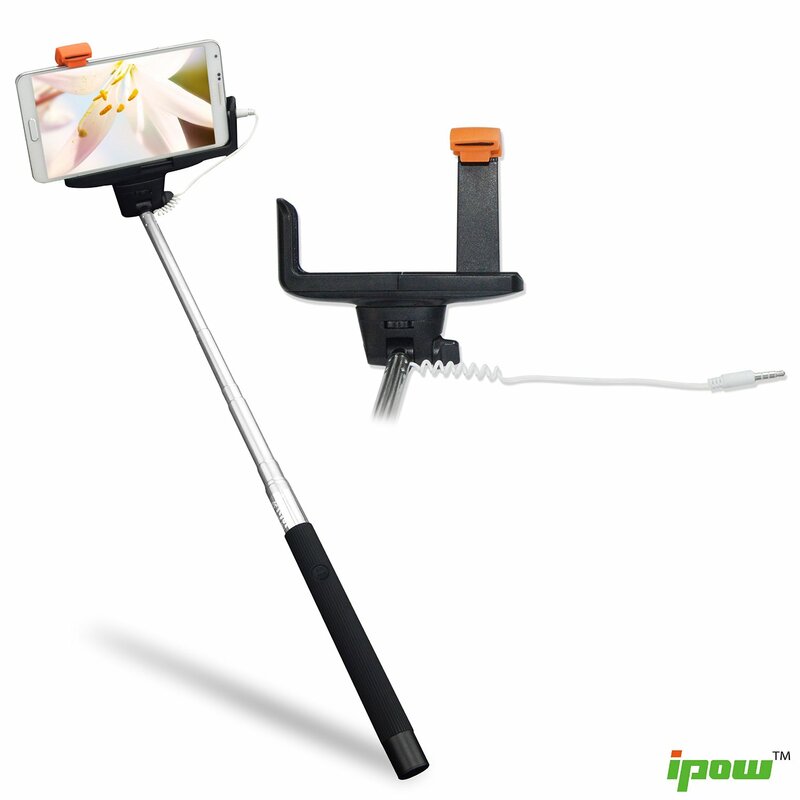 The pairing of the device is done through a small cable connecting the selfie stick to your phone as shown in the diagram below. I hope that now you really understand each and every essential part of a selfie stick. If you feel like getting your own one, please be reminded that there are many different kinds of them out there. You can learn more from the link I provided above regarding the different types of selfie stick where I will be discussing the pros and cons, prices and much more! Do you have any questions regarding the topic? Feel free to share with us! We would be really happy if we can help you in any ways. Please share this post with your friends by clicking the share button below!